Without professional attention, opener motors can fill up with dust and debris, cables and chains can become dangerously loose, and doors can fall out of alignment. All of these problems can cause serious inconvenience, and depending on the extent of the damage, they can be costly as well. 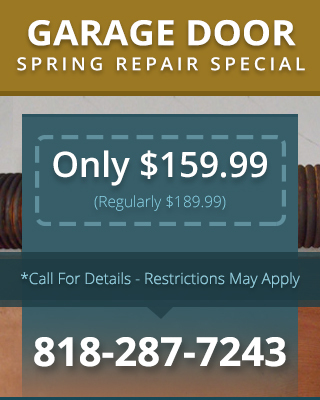 Limiting the damage and inconvenience caused by loose, worn, or damaged parts is as easy as getting garage door maintenance Calabasas CA from a qualified professional. You can trust our expert technicians to perform a thorough assessment of your garage door and provide honest recommendations as to what repairs may be needed. Safety is a top priority at Carroll Garage Doors. Though virtually every garage door opener system comes with safety mechanisms, these mechanisms need maintenance in order to stay effective. Over time, sensors can get out of alignment or get covered in dust and dirt. Auto reverse features can get overactive, making it impossible to shut your garage door if there’s even so much as a leaf beneath it. If you want to keep your garage door working properly and avoid accidents and other nasty surprises, investing in our preventative maintenance services should be very helpful. Because our technicians are experienced with all kinds of garage doors and opener systems, we can provide whatever kind of safety repairs you may need.